A personal iGene Passport gives you access to practical information to help you live a healthier and happier life, based on your own DNA profile. discount code worth € 70. Placing a pre-order does not bind you in any way. It has been scientifically proven that lifestyle habits can have a big influence on your health. If you add positive habits to your routines , you could potentially add 15 years to your life. And that's even easier than you would think. Order your DNA-kit today; The smartest way to stay healthy longer. Curious about your own genes? With an iGene DNA test you get a clear insight into your own genetic predisposition for a list of hereditary diseases. We also tell you about your personal response to certain medicines based on your DNA profile . We'll send you practical and informational messages related to your personal hereditary characteristics. Common lifestyle advice is difficult for many people to apply to their behavior. That's why iGene gives you personal lifestyle advice, based on your DNA profile. This way you can easily see which actions may benefit you the most. Besides: all provided information is scientifically validated. We take great pride in that. "Health advice is all over the place. It just confuses me. I love how iGene filters, checks and prioritizes health advice based on my own DNA!" Let's assume that Alzheimer's is common in your family. Your DNA reveals, however, that, based on current scientific knowledge, you do NOT have a greater genetic predisposition to the disease. That does not mean you will never get it, but it is reassuring nonetheless. Let's assume that your DNA reveals that you have a significantly increased risk of contracting Parkinson's disease. However, there are known factors that may reduce this risk. 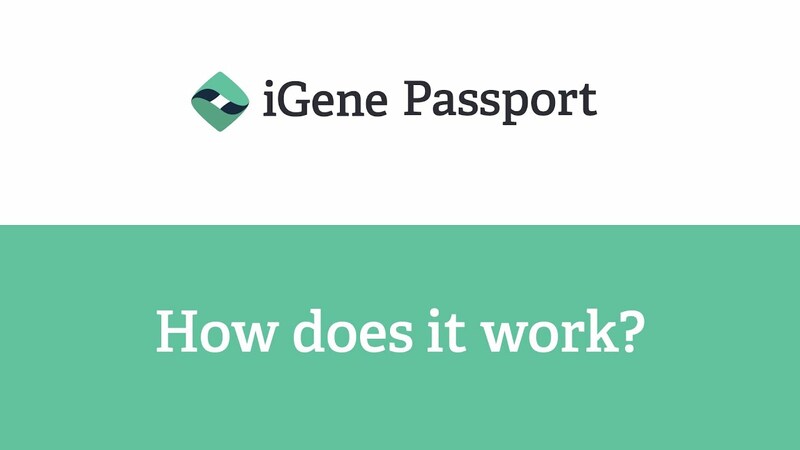 We share this information with you via your iGene Passport so you can make use of it yourself. That does not mean you will never get Parkinson's disease, but you can take active steps that may help prevent it. Does your DNA indicate that you have a significantly increased risk of intestinal cancer? If so, from time to time the iGene message service will send you a reminder to have a check-up. After all, this disease can often be treated effectively if it is detected at an early stage. For many diseases there are a number of drugs available containing different active substances. Does your DNA suggest that your body is likely to respond better to one active substance than another? If so, we will tell you. By sharing this information with your doctor, you increase the likelihood that he or she will select the right drugs and dosage for you more quickly. Generally speaking, eating fat is bad for your health. However, there is a group of people for whom eating fat is a good thing. If your DNA reveals that this is the case, it would be good to know, wouldn't it? The iGene Passport is a personal overview of diseases that you have a reduced or increased genetic risk of contracting and also offers you lifestyle advice based on your DNA profile. This means that, on the one hand, you can relax in the knowledge that you no longer need to worry unnecessarily about certain diseases. On the other hand, you know exactly what you do need to look out for. In your iGene Passport you will also find information on personal features and characteristics in which genetic predisposition plays a role, such as the colour of your eyes, your predisposition to endurance sports or your sensitivity to alcohol. You will receive personal lifestyle advice via the iGene message service based on your DNA profile. This includes useful tips, tasty recipes and interesting facts. Every week you will be sent a message containing information that can benefit you. This will help you to optimise your eating and living habits in a simple way.